Leave it to lawyers. According to a report on CNN’s web site, the brilliant rescue of 15 hostages from FARC by the Colombian Military could be considered a breach of the Geneva Convention. The Colombian Military persuaded the Revolutionary Armed Forces of Colombia rebels to release the hostages to a supposed international aid group for transport to another rebel area. As we all know, the hostages were former presidential candidate Ingrid Betancourt, three U.S. military contractors and 11 Colombian police and soldiers, some who had been held captive for over 10 years. Tell this “legal expert” to take a hike! 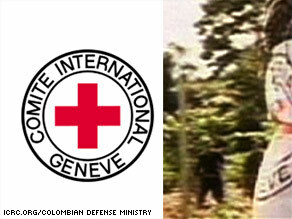 So let me get this right, the misuse of the Red Cross symbol in a humanitarian rescue of hostages by the Colombian Military is a war crime. — But when Hezbollah and Hamas and Al Qaeda use phony Ambulances with the “Red Crescent” to kill unarmed civilians that’s OK? How is it people yell war crime when someone uses the red cross symbol to save lives yet when people use it for malicious acts like when Hamas used a red cross ambulance to transport weapons? I just want to say that because of this article, and because of this article alone, I will stop reading cnn.com. This faux controversy is not news fit to print. If the legitimate operation to RESCUE HUMAN BEINGS THAT ARE IMPRISONED is being deemed as illegitimate – while the very kidnappers are not even mentioned – I refuse to expend a single second of the rest of my life reading anything else a CNN writer will have to say. Obviously any rational human being (not to mention any “humane” being) will scoff at this attorney’s position. And even if justified by ink now dry, written in a time immediately following direct conflict between superpowers, the articles of the Geneva Convention do not protect terrorist groups any more than they protect rapists, murderers, or white-collar criminals. Terrorists are criminals, not valid soldiers of war. To categorize them as equal in any manner demeans true soldiers while emboldening monsters. So on that note, maybe it’s good that this came up. Our own Supreme Court seems bent upon extending Constitutional rights to foreign terrorists. Maybe it’s time someone actually went through the international legal process of “splitting hairs” in excluding terrorists from the dictates of the Geneva Conventions. Unsubstantiated hearsay. CNN ran this as their top story, seriously undermining their own journalistic integrity. Posting pictures that they themselves say came from a source that demanded money. CNN refused payment but was able to obtain fuzzy photos and choppy video that DO possibly show the International Geneva symbol (bibs worn on certain personnel). However, context (which in THIS case in inherently paramount) cannot be established. Who was wearing the bib. At what time of the operation was the person wearing the bib. So many questions for this “source of information”. And with the introduction of payment for story, its authenticy is tainted. Buried halfway down in CNN’s story is the only true first-person account to establish context. Why the quote is buried raises more questions about CNN’s motive (sensationalism vs journalism). The witness is former Colombian Presidential Candidate Ingrid Betancourt. The only on-record witness in this particular CNN article to refute any claims that International Red Cross symbols were used at the point of extraction. Apparently, this source account is not good enough to establish legitimacy for what is otherwise a courageous and commendable rescue attempt. Oh for sure war crime…..laughable. I’ll keep it short. Let’s take the lawyers, writers and anyone else that will undeniably stand behind comment of this “misuse of the RC Emblem”, drop them in a country foreign to them, say oh I don’t know Kenya. Wait until they are taken by force and then kept in captivity for 10 years. Sounds like the beginneing of a joke but what ‘s a columbian lawyer’s defention of International humanitarianism…. Ridiculous article, and the video of the 15 year old Canadien kid that thought it was a good idea at the time to lob a grenade at U.S. soldiers, but now really, reeeeeaaaaaaaly reeeeeeeeeeeaaaaaaaalllllllly regrets it because he wants to go home….it’s all crap, and to what end. How about a video of a military burial, or hospital footage from Iraq and Afghanistan showing horrific losses of life and limb? This revelation is simply shocking…..I, for one, say bundle up the recently freed hostages, chopper ’em out back to the jungle, and let FARC parade them around the outback for another half decade or so. Seems to be the only fair thing to do under the circumstances…..Maybe throw in another bonus hostage to soothe any tensions that may result from such an obvious breach of justice….. Does the Red Cross routinely supply transport for organizations (FARC, US or otherwise) that would make it believable for a group like the FARC to think that the Red Cross would transport their hostages without trying to help them to escape? If this is the case, I really need to seriously consider my regular donation to that organization. Making sure that prisoners are healthy is one thing. Furthering he ability of organizations to keep the status quo on this is a whole other. So which is it? That CNN is making it up? That Red Cross is unworthy of my support? Or that FARC is just that stupid? I totally agree. What do we care about the emblem? Hostages were freed!And we are reminded that there are people & groups who abuse this in greater and horrific manner. Newspeople love to thrive on our short memory. Political correctness will just get tighter. Next it will be wearing the wrong T-shirt in a rescue situation. As usual, CNN runs a slated story. The thugs have no rules, yet when the good guys bend them a bit and save some lives, CNN runs it as a horrible tragedy against justice. Rather than center on how the red cross symbol was misused, let’s try to report a story on how lives were saved. Of course, that wouldn’t be good liberal reading. Next time we try to rescue someone, and it seems that the red cross symbol won’t work, how about we just blow the thugs all to hell. It’s called war you idiots. They don’t have rules, so lets just kill them. Good god. I will be more than happy to chip in for one way tickets to air-drop (yeah with working parachutes, I’m nice) who/whatever complains about the hostage rescue into FARC territory. Think for a minute: Why would the FARC willingly give up its hostages to some entity with a helicopter? They must have been on good terms with some entity that commands helicopters – they weren’t going to risk their prize asset (Betancourt) if there was the SLIGHTEST question of whether they were *with* the FARC or against them. Since whoever inside FARC loses a prize hostage is probably gets executed it’s not a spur of the moment thing. Who has long distance capable heis? Governments and a few NGO aid organizations, like the Red Cross. It is rather suspicious for a well-oiled heli to show up in the jungle, so they would simply start shooting UNLESS they had a friendly back channel relationship with one or more “humanitarian” groups who they trusted would not free the hostages or reveal where they were imprisoned. It is actually the Red Cross that has explaining to do. I’m just glad to see that there are still functioning Americans in this country. The story is ridiculous and what they should be asking is does ANYONE care how they got the hostages released. Now , of course, the liberals will be outraged that a government would use the same tactics that the FARC and other terrorist groups use to daily kill and maim their own countrymen and women and children. I say GOOD JOB COLUMBIA. It’s a shame that Columbians had to rescue Americans, because, if I understand the story correctly, the Red Cross usually helps the terrorists and warmongerers keep their hostages. The points made in the earlier posts were right on the money. Please, someone explain to me why the Red Cross is allowed to function in this country when they aid and abet the worst kinds of terrorists and criminals. Any good will that the Red Cross has gotten out of me is gone, dried up and if they ever call or mail me solicitations , I’ll be happy to tell them exactly what I think of them now. I’ve also come to the conclusion that the United Nations needs to find themselves another country to support them. They are a waste of breathe and as everyone says we need to cut back on our carbon signatures, so send them to Europe, so they don’t have to fly back and forth. Let France subsidize them for a couple decades. This has truly been one of the stupidest articles I’ve ever read and in this current day and age, that’s saying a LOT. I agree with Robert Baldwin, if anyone wants to argue about how the hostages were freed then volunteer to take their places and we’ll be happy to take up donations to help pay your way. Of course, that will seriously derail the “entertainment” industry in this country, but I for one will happily suffer through it, to get FARC some more hostages. Here’s a novel idea, why don’t we elect “politicians” who actually like this country. But that’s another rant, Terrorist operations aren’t necessary in this country. We have elected officials that hate America far more than any other terrorist group in the world. I don’t necessarily agree with the idea that it is a war crime, but it’s worth noting that using the Red Cross emblem when you’re not Red Cross can potentially jeopardize future Red Cross efforts. Now a Red Cross official may be thought of as counter-paramilitary and will be killed while simply trying to give aid to hostages. The Red Cross is not a military organization as some of you seem to believe. It’s not, and never been, their job to rescue hostages – they are simply neutral assistance to those unfortunately caught on the wrong side of dead man’s land. I really don’t even think CNN is trying to complain about the rescue – and many people are using this as a straw man. I think they are just trying to argue my above point – that this could jeopardize non-military intervention that the Red Cross does. I do not understand… probably Mr. Karl Penhaul is a ‘chavista’ that is not happy because we finally had a victory over the FARC. Please let us Colombians enjoy this victory; the FARC hold this guys for up to 10 years, Mr. Penhaul, is this a crime?, would not you use the ‘red cross’ or any other logo? This is not an equal war we are fighting with the FARC; this group uses resources that no GEVENA convention will allow EVER. Please stop the bad press and let our country finish what we had started: the extinction of this plague, the FARC. I can understand the people pissed off about this because I am split over it. However most people don’t see the other side. If the government of some country uses the Red Cross to fool some thugs into releasing some long held hostages the next time the Red Cross tries to actually aid people they might be turned away for fear that they are not who they say they are. That is the whole point of the law in the Geneva Convention. I can’t believe CNN fell for this……this rescue was a humatarian rescue to free the hostages……..everything counts here. I guess I have to switch to FOX news now! Are you serious CNN??? Maybe we should send them back to make those jungle terrorists happy, because that’s what they are terrorrists not soldiers fighting in a war. Please never, ever compare these lunatics with any soldier out there. great stuff. I’d say they should round up those hostages, the CNN reporter and the idiot lawyer and deliver them all back to FARC vio a Red Cross helicopter then ask FARC to pay for the expenses with dirty drug money…happy now? Get real, the Red Cross has no purpose in transporting prisoners or hostages, period. Apparently, that’s been acceptable in the past, why didn’t CNN pick up on that? Any way you can combat a force that doesn’t give a damn about human life and win is OK by me. i would send them a message,” If you don’t like it sue us”. OK CNN, YOU’VE REALLY DONE IT THIS TIME-GO TO HELL!!!!! as if the rest of the world is not upside down enough having to be ‘fair’ to other terrorists that mostly have to do with the US, don’t you dare stick your nose in Colombia’s business. So what does CNN want to do this time? how about we return the hostages for another 40 years, and trow in your reporter for a bonus? Colombians have suffered enough and it’s about time the good guys take the country back…oh, I know, maybe this CNN reporter is getting ‘bonuses’ from Ortega, Correa, and Chavez? makes you think. Why have you not reported on how terrorists overseas use ANY means possible to get innocent people hurt and save their mass murderers? I had started to watch CNN everyday since the rescue of the colombian hostages was aired live-I really thought that was great reporting since no one else cared about it until then, but this crosses the line–you have lost a household viewing. This is nonsense and totally BS! The soldiers saved lives and treated the guerillas humanely. Give us a break cnn. You can do better than that. FARC kills and tortures hundreds of hostages over years and years. The heroic rescuers perform an amazing feat and commit a “crime” which is the equivalent of jaywalking. Without CNN, I would have gone to my grave without knowing the rescuers were actually evil rule-breakers committing war crimes! CNN is right–leave the bad guys alone (they have REASONS for what they do, so all is justified) and mercilessly beat on the good guys (we are inherently bad so anybody fighting us must be good no matter what they do). This isn’t just journalism, this is social justice! You go, CNN!! It is incredible that CNN will publish such a lie. Everyone knows you can manipulate photography to show “whatever you want”. This is yet another big lie and it is really ashame that CNN will second inputs from a FARC-Chavez/leftist unknown source. Why hasn’t CNN publish the video and pictures of all the hostages who publicly offered testimonies of no ONG/Red Cross/Other entity logo utilization in the national Colombian television? WHY???? This is a huge lie and big deal for Colombians. >95% of Colombians support President Uribe, the Colombian Army and soldiers. This is a huge disrespect to the soldiers heroic everyday sacrifice. Why doesn’t CNN publish an article on the professionalism of the Colombian soldiers instead? I request Mr Karl Penhaul to publicly apologize to the Colombian people and soldiers for publishing this article. I invite him go to Colombia, talk to our soldiers, to our President, and then go to Venezuela, Ecuador, Nicaragua, Switzerland, and understand what is really being planned against Colombia. If Mr Penhaul was intelligent enough, he would realize he is being “utilized”. The evil leftist group of countries and their leaders are planning to take over Colombia (which is by the way the only true allie of the US in Latin America). The war here is at another level…the spiritual one. While the Colombian president daily prays the Rosary, Chavez, Correa, and Noriega are performing Satanic rituals (i.e. bubaloo, etc). Get documented Mr Penhaul…and then publish a good article about Colombia. While you do that, I agree with other commentaries above…you just lost a CNN customer/reader forever! Shame on you! It is unacceptable that despite the fact that CNN was “unable to verify the authenticity of the images”, it still published an article with the title “Colombian Military used Red Cross Emblem in Rescue”. That is a serious accusation that, unless it is 100% verified, it cannot be published in that tone. For that reason to me, the news is not even worth discussing.